While I was packing and trying to organize the mountains of papers we’ve collected over the years, I came across my adoption papers. Of course, had to read them for the thousandth time. 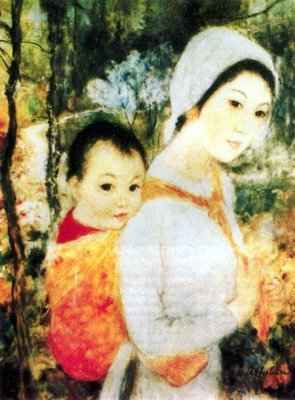 They say, “Le Thi Buu Tran of unknown parents…born in the city of Saigon”. Seems they gave me a name for adoption purposes. Why did they do that? Further down it states that “..Le Thi Buu Tran is hereby changed to….” and it states my American name. The bitter part of my being wants to get angry. I want to scream, “You give me a name so you can steal it away again?” Another part wants to say, “Thank you for giving me another link to my past.” It would have felt like another loose end among so many to simply be called “girl child”. Even if concocted for mere legal purposes, I am proud of that name. It’s among my other keepsakes; my adoption papers, a passport, a set of chopsticks, two black lacuared vases, a black laquered cigarette box with inlaid mother-of-pearl village scenes and what is contained in my genetics. Despite the prevailing notion that Islam discourages adoption, I find it hard to reconcile this idea with the fact that the care and protection of orphans is stressed in the Quran. While there is some distinction between “care” and “adoption”, adoption itself doesn’t seem to actually be discouraged. The Prophet(pbuh), himself adopted a slave by the name of Zayd bin Hâritha. There are certain restrictions on adoption, the keeping of an orphan’s identity being one of them. Despite everything, I still recommend adoption as long as the original “identity” of the child is kept as in tact as possible. It is important that an awareness of its importance be kept in mind. Speaking from personal experience, I agree with this wholeheartedly. While in the West, giving an adoptee “your name” is a sign of acceptance, in some way, it is also a rejection of the child’s heritage. My own father followed the middle road. He gave me his surname and an American first name, but he made the knowledge of my heritage available to me and stressed that I not forget. It’s more of my feelings as I stated in my post, The Adoption Paradox, that have prevented me from making further inquiries. Insha’Allah someday soon. * “As described in many books written by Asian adoptees that have emerged in recent years, their experiences confirm that because they tended to grow up in an almost all-White environment, they never had to think about their ethnic identity — they just assumed they were like everyone else. That is, until they experienced some form of racial prejudice or discrimination from schoolmates, strangers, or even relatives of their adopted family. Despite all my family’s attempts, I carried a feeling of being “rootless” into my adulthood. Until around the age of fifteen, I lived with my mother who, through no fault of her own, cared little about my ethnicity. It wasn’t that she dismissed it out of arrogance or intentional neglect. She simply didn’t think it mattered. I was her daughter and her origins were my origins. I still must stress that my adopted parents are wonderful people. I neither fault them for the negative aspects of my adoption or blame them for not being aware of it. Probably one of the most damaging events to my self-esteem occured in elementary school. Awareness of my being different occured when my classmates started referring to me with ethnic slurs. Because of this, I would later view my “differences” in a negative light. “Gook” is bad, “gook” is Vietnamese, I am Vietnamese, I am bad. My parents were completely unaware of this, as far as I know. I never spoke of it to them. I can’t say why I kept it to myself. Perhaps my inmature mind feared they would also come to think of me as bad and reject me if they knew I was so different that it brought ridicule from others. Maybe it’s just the way children normally respond to bullying and humiliation at school. I didn’t come into contact with another Vietnamese until a family in the same town adopted a 13 year old Vietnamese boy. I was around ten at the time. Oh, how I envied this boy! He had memories of Vietnam. He knew with all of his senses what it was to be Vietnamese. I was inevitably drawn to him as the path to knowing more about myself. It was to my disappointment, that he whole-heartedly rejected his heritage. He refused to acknowldge that he had a life before coming to the U.S. While I was struggling to reach beyond the limits of my own “Americanization”, he was struggling to assimilate. I can’t say I blame him. At such a crucial time in adolescence, I would expect him to try and fit in as quickly as possible. I would come to understand his behavivor when I entered my own teenage years. I wouldn’t come into contact with a Vietnamese community until I was attending college. I was thrilled when I was approached by a member of a Vietnamese organization within the school. His first question was, “Are you Vietnamese?” to which I replied, “Yes.” His second was, “Do you speak Vietnamese?” to which I replied, “No.” “Thank you,” he said as he made a quick exit. For the second time in my life, I’d had felt the rejection of “one of my own “. It would put a halt to all pursuits of my Vietnamese heritage for over a decade. I can only guess at all the ways my experiences affect my attitudes and behavior. I know that it must have had an effect, since as human beings, we are all shaped by our experiences. I have yet to uncover any specifics other than the emptiness I have carried with me throughout my lifetime. I have learned to embrace my multiplicity, but I am always drawn back to my beginnings. Vietnam is always calling, beckoning me to come so that I might know her. While ethnicity may mean very little in the greater scheme of things, to one small Vietnamese adoptee, born in Saigon to unknown parents, it can mean the entire universe. *Copyright C 2001-2005 by C.N. Le. All rights reserved. Suggested reference:Le, C.N. 2005. “Adopted Asian Americans” Asian-Nation: The Landscape of Asian America. “>http://www.asian-nation.org/adopted.shtm (January 22, 2005).